According to a new market report pertaining to the thin client market published by Transparency Market Research, the thin client market (North America, Europe, Asia Pacific, Middle East & Africa, and South America) is projected to reach US$ 2,124.7 Mn by 2026 driven by increasing popularity of the concept of cost savings across all industries. The market is projected to expand at a CAGR of 1.16% during the forecast period from 2018 to 2026. Growth of the market is attributed to high adoption of cloud technology. North America is anticipated to lead the thin client market, followed by Europe and Asia Pacific, during the forecast period. The thin client market is at an emerging stage and is anticipated to expand rapidly in the next few years. One of the significant reasons for deployment of thin client solutions in an enterprise is cost saving. Cost savings are possible through lower device costs as compared to PC substitutes, and the option to reuse older hardware. Cost saving is also achieved by making the systems energy efficient through lower heat generation. IT operations could benefit through the central management of all the thin client devices, together with patching and resource allocation between devices. Thin clients and the transformation of "fat" clients (PCs and laptops) to thin clients provides an opportunity for thin client dealers to market their products to cost-sensitive enterprises due to the relatively low cost of refurbishment of old hardware that has already been deployed, and/or purchasing new thin client hardware solutions. High cost savings as a driver accounts for high impact on this market, as it is a factor that most of the companies are looking forward to. The thin client market has been segmented based on components, enterprise size, end use industry, and region. Within the components segment, hardware component is expected to dominate the global market in 2018 owing to the increasing use of mobile based thin clients. North America led the thin client market, accounting for substantial share in 2017. The U.S. is the major market for thin client in the region. 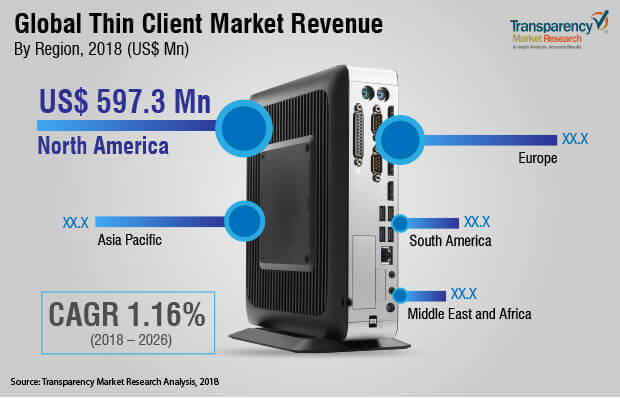 The thin client market in Europe, Asia Pacific, Middle East & Africa, and South America is also expected to grow during the forecast period. The research study includes profiles of leading companies operating in the global thin client market. Key players profiled in the report include Samsung Electronics, NComputing Co. Ltd., IGEL, HP Development Company, L.P., Dell, Cisco Systems, Inc., 10ZiG Technology, Acer Inc., and Advantech Co., Ltd.